Friend and moutain biker from Monrovia, Brad, sent me the above photo he took Sunday (Jan. 29, 2012) of Cogswell Dam and reservoir. He took the west fork bike path to the reservoir.and shot this from a vantage point from above the site. He asks why the water level appears to be way down. I don’t have an answer, except I know that rainfall totals this season have been down. They are at least 2-3 inches below normal. So perhaps there is less runoff flowing into the reservoir. Cogswell is one of three reservoirs reachable by Highway 39. 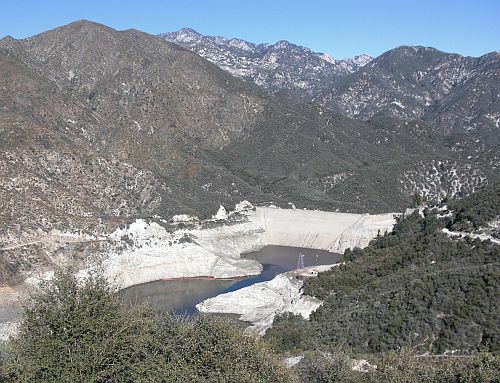 The other two are more visible and right off the highway: Morris Dam and San Gabriel Dam. The last time I drove past these two, a few months ago, it seemed like they had plenty of water in them. Thanks Brad for this shot of Cogswell. ANd please pray for rain! I could barely make out the words uttered from the man seated several rows behind me at Walnut City Hall. “Corporate welfare,” I finally heard him say. The two words were spoken just as Walnut City Councilman Tony Cartagena discussed a recent meeting with the Contract Cities Association on the topic of redevelopment. The governor and the Legislature approved a measure wiping out all redevelopment agencies in the state. That means all 88 cities in Los Angeles County must end their redevelopment practices by Feb. 1 unless a bill by local state Sen. Ed Hernandez that gives cities until April gets approved. Either way, the outcome is the same. Redevelopment will end. Period. too, but a criticism has always been that school districts would lose out on their share of property tax increment. There’s also some validity to the “corporate welfare” argument. Some cities would offer subsidies to, say, vastly rich Starbucks or Wal-Mart to put a store in. But I say that criticism is painting with a broad brush to vilify redevelopment when the guilty parties should have been exposed instead of the baby being thrown out with the bath water. Cartagena said so Wednesday night. “Instead, they should have gone after the ones that abused it,” he said. Cartagena is correct. Walnut, a contract city, does not spend millions on its own police and fire departments that ring up high personnel (read: retirement pension) costs. It and others turned to redevelopment wisely to build public projects. They’d often save money for years to do so. It’s why Walnut is recognized as one of the best places to live in the country. “Our senior center. The Walnut-Diamond Bar Sheriff’s Station. The library. Equestrian trails,” he said, going through a quick list, all financed through redevelopment funds. Rightfully so, the Legislature tightened up the law and ruled out “economical blight” as empty land. Later, Diamond Bar, an upper-middle class city, tried redevelopment of a shopping center and the case ended up in court. Again, the court said the city did not have enough blight for redevelopment. So, yes, there have been abuses. There have been patches applied. But more importantly, we can point to the redevelopment success stories: Old Pasadena, Old Town Monrovia, Main Street in Alhambra (though in my view, still a work in progress), San Diego’s Gas Lamp District. And there are many smaller successes, such as affordable housing projects and restoration of historical buildings for reuse. As Walnut Councilwoman Mary Su noted, the state is looking to create a new type of economic development tool for cities to use. All while cities hand out pink slips to redevelopment employees – a bad move in a struggling economy. No, banning redevelopment was not about getting rid of corporate welfare. If it was, we’d have closed the loopholes in our country’s tax code that allows many corporations to pay zero taxes. It was all about money. It was just a way for Sacramento to get its hands on more money to pay for social services and state pensions. So Gov. Brown hit up the oft-criticized redevelopment tool – a soft spot in local governments – to accomplish that goal. I don’t believe schools will see a windfall. In fact, the state budget calls for more cuts to schools unless residents vote in a half-cent sales tax and approve higher taxes on wealthier Californians. What I see is economic vitality fading in the San Gabriel Valley, where smaller cities need every tool they can get to re-make themselves. I hope they find a new way. NORMALLY, you don’t think of rows of potted plants parked on a paved strip as open space. Ditto for a golf course, a baseball field, volunteer willows behind a dam or commercial nursery plants thriving beneath high-tension towers. But they are. In fact, some cities mark these down as official open space in their general plans. In a county with 10 illion people, where rows of rooftops and hundreds of thousands of acres of steaming asphalt dominate the landscape, these oxygen-producing, carbon dioxide eating postage stamp lots — temporary in nature — are sometimes all we get. So, you shouldn’t wonder why people try to hold on to them like a miser does his last nickel. Last week, I reported on yet another nursery packing up its plants and going home. Norman’s Nursery, a wholesale outfit since 1949, has cleared out a mile-long strip of trees and ornamentals that were packed along the Santa Fe Dam on the border of Baldwin Park and Irwindale. For 20 years, your eye went to the green junipers, the date palms, the ornamental elms. The trompe l’oeile visage said they were planted there. Like an urban forest. Instead, they were as real as the lollipop forest of the kids’ game Candyland. Today, that greenbelt is gone. And others could be next. I don’t deride people for becoming attached to such temporary greenery. To the contrary, I get angry when nobody cares. not hugging a tree is the sin. The issue of open-space-that’s-not-traditional open space exploded onto the pages of the Pasadena Star-News in 2007 when residents of East Pasadena fought to stop Edison from parlaying leases under their wires into permanent developments, such as those ugly self-storage buildings. The idea originated with the California Public Utilities Commission. But like a downed power line sparking a fire, it blew up in their faces. “They thought it was a way to reduce rates but it hasn’t worked out that way. It’s causing public concern about global warming and building on potentially useful recreational or passive open space,” said one opponent back in 2007. The good news was, Persson’s Nursery, and Present Perfect Nursery, both in East Pasadena, were saved for the time being. The bad news: In August 2011, Persson’s closed down shortly after its owner died of cancer. Today, what’s there — an empty lot — is what many — including new Pasadena Councilman Gene Masuda — tried so hard to not let happen. In West Covina, residents rightfully want to stop a four story, 55,680-square-foot “office condo” project on West Covina Parkway that would kill 100 trees. Worse, the project would threaten the urban green space that surrounds the West Covina regional branch library and West Covina City Hall complex. These places are these residents’ giant sequoias. They are their redwood forest. Their Yosemites. Because they are the ones who walk among these planted trees hoping for a slice of solitude, a fleeting vision of purity. Psychologists advise patients with anxiety or panic disorders to plant their feet firmly on the ground. It’s a technique called “grounding.” The simple act communicates to the patient he or she is strong, safe, that the bad things he or she predicts will take place will not. Grounding is best done in the outdoors, where man-made stimuli are shut out. Where the reality of standing on the earth and feeling a cool breeze make the anxiety go away, at least for the day. We can’t let the green spaces fade to gray, even the temporary ones. And if we can’t stop it, then perhaps we can plant others. Because when they’re all gone, where will we go to become grounded?